Healthy Happy Santas Helping Parents Promote Healthy Kids? Holidays, like Christmas, Easter, Thanksgiving even All Saints Day which now for the most part is celebrated as “Halloween” were all intended to bring us together with healthy and life-affirming traditions. Yet, sadly, most of our cultural events have been invaded by the processed food industry, heavily marketing their holiday-themed candy and sugar laden foodstuffs and beverages. Their efforts have become so pervasive many Americans now think Candy Canes, marshmallow bunnies and candy corns are the reason for these festivals. Thankfully the Hypoglycemia Support Foundation (HSF) brings us the awakening to the awareness, education, and actions needed to empower people to once again achieve healthy lifestyles and recapturing our former life-affirming practices. Healthy blood sugar is at the foundation of preventing metabolic disease and maintaining metabolic health. Based in large measure on the findings of the HSF, the mission of Sustainable Santa® and the Real Santas United for Healthy Kids is one positive strategy for demonstrating that our sacred holidays have nothing to do with unhealthy processed foods, and that promotion of enjoying life affirming Real Foods are what deserves our adoration. Eckfield and wife, Helen Nielsen, have developed a three-step plan to encourage fellow “real bearded contemporary Santas” to introduce healthy living concepts to kids. Step one encourages Santas to share three “Food Rules,” inspired by both food journalist Michael Pollan and the lifestyle practices followed by families in Europe. Eckfield says it takes just seconds for a Santa to teach a child these simple rules, such as “If you are hungry, eat an apple. If you’re not hungry enough to eat an apple, then you’re probably not hungry – in other words, don’t eat just to have something to do.” Collectively, the 3 Food Rules helps children break the habit and pattern of eating fast, snack, and processed foods which have become the staple of the SAD (Standard American Diet). 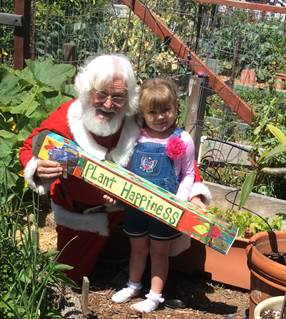 Step two is to encourage kids to “Eat Real Food” by placing “Healthy, Happy Santas” into farmers’ markets where it’s easy to embolden kids to try new fruits and vegetables (eat the rainbow!) and even fermented foods. The farmers and Santas team to present what they call “Garden Bites” tastes of real food for the kids to sample at the markets. Step three is to recognize that if America’s goal is to “be Great again,” then first we must become healthy again. 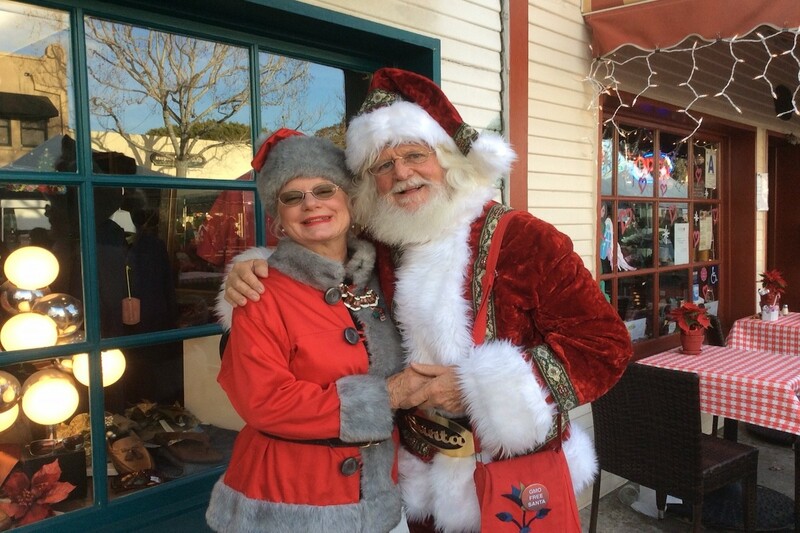 The Santas believe they can play a productive role in reversing the past three decades long trend of consuming unhealthy food-like substances in favor of consuming nutritious fresh, whole, real foods which will make kids “Healthy, Happy and Fit for Life” – the goal which the Santas share with the parents. Richard Eckfield with Dr. Robert Lustig, pediatric neuroendocrinologist and global public health advocate. 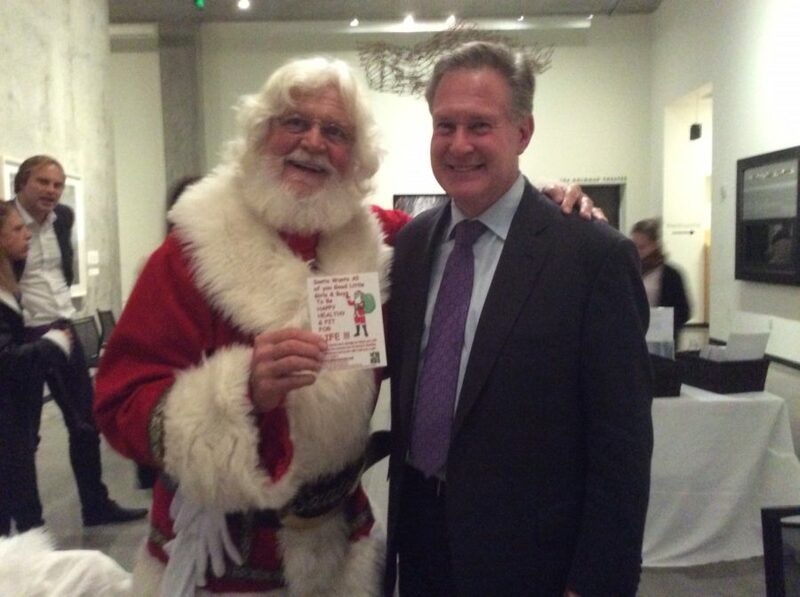 The Real Santas United for Healthy Kids are no longer a sugar Santa marketing tool. Santa has been used to sell junk food & sugary beverages. The Hypoglycemia Support Foundation and other groups concerned with children’s health support this important movement to take back Santa from ambitious marketers who want you to believe Santa is a jolly purveyor of sugary beverages and processed foods. 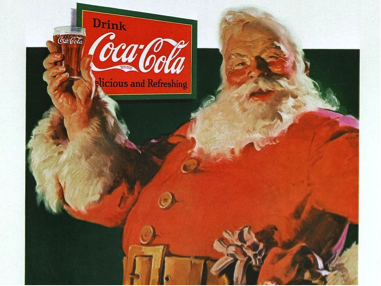 The current image of Santa was shaped by soda pop marketing.